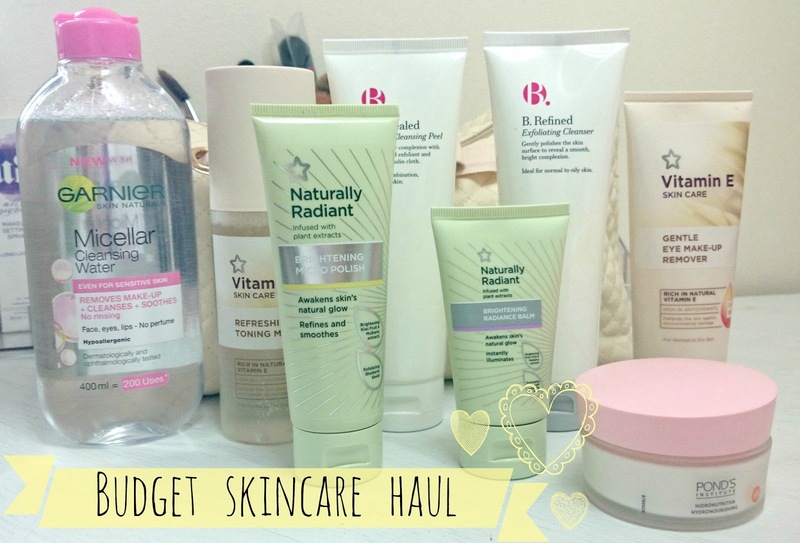 In an effort to get my skin wedding ready I have been on the hunt for some skincare treasures. But, of course, with a wedding to pay for, budget is a big concern, so I wanted to look for products which are purse friendly but also deliver results wise! I took to my social media to ask my sweet readers what their skincare secrets are and I was given many wonderful recommendations and options! One comment that stood out to me was on my Facebook page, where a lovely follower recommended Superdrugs very own ranges, so I went shopping right away! I am usually a Nivea girl through and through (particularly moisturiser wise), but as there were no offers on and my reader Charli has such high praises for the Superdrug ranges I knew it was worth giving them a try! First off, I picked up a couple of items from Superdrugs Vitamin E range. They are currently on offer at buy one get one half price. The Vitamin E Refreshing toning mist (£2.99) is a real steal. I have recently run out of my BodyShop Vitamin E face mist so I thought that, at such a tiny price, this one would be well worth a try, and I am so glad that I did take a chance on it. The scent of this product is amazing - I actually prefer it to the BodyShop shop alternative - it is infused with aloe vera which is very comforting and instantly refreshing. I think this would be a great product to have in your handbag throughout the summer months or on a holiday, as it just makes you feel amazingly refreshed seconds after use! The vitamin E enriched formula means that this will protect your skin against environmental damage and even help toward premature ageing! The Vitamin E Gentle eye makeup remover (£2.99) is something I am unsure about. Charli did warn me that it is not effective at removing waterproof eye make up and I have to say I agree. Although it has been very caring on my sensitive eye area, I do find that it takes me at least 2 or 3 cotton discs per eye with just regular non-waterproof eye make up, so I have ended up going through this quite quickly. 2-3 cotton discs per eye may not seem like a lot to some, but comparing it to using just 1 per eye with my usual favourite NIVEA double effect eye make up remover means that I am, unfortunately, not sold on this. Next up, I had a look through Superdrugs Naturally Radiant range, also highly praised by Charli and currently on offer at half price. I was drawn to the Naturally Radiant Brightening micro polish (£4.99). I love polishing scrubs as they always seem to make my skin super soft and glowy from the first use and this one is no exception. It is infused with Kiwi and Mulberry extracts which help to even out skin tone. I have to say that I'm not overly keen on the scent of the products in this range, but it doesn't last long so I don't mind too much! The scrub works to remove dead skin cells, leaving a fresh and bright complexion! I was also curious about the Naturally Radiant Radiance balm (£5.99). I read great reviews about this on the Superdrug website and I thought it was worth a try for £2.98. This product contains Kiwi and Mulberry extracts as well as sugar beet which is a natural moisturiser, Again, I'm not mad keen on the scent but it does leave my skin very soft and smooth and I also like the fact that it promises to refine and even out skin tone after 4 weeks use (I'll get back to you on that!). Finally, I chose out something which Charli said she really enjoyed. This is the Naturally Radiant Hot Cloth Cleanser (£5.99). Hot cloth cleansers are a relativity new concept to me and the fact that this one comes with its very own muslin cloth is fantastic as I didn't have one of my own. Reviewers have even called this a dupe for the very much hyped about Liz Earle hot cloth cleanser! This product is enriched with cocoa butter and is so lovely and creamy. It effectively removes my make up and it also gives a very gentle exfoliation which makes my skin super supple and soft and makes me feel very clean - it's almost like a mini facial! I am so glad that Charli recommended this product, it is a bargain and I will definitely use it again in future! I also decided to pick up a couple of the B. products, which are exclusive to Superdrug, as they are currently half price. There are so many things that I want to try in this range but I was very good and only got 2 this time around! The B. Revealed Glycolic Cleansing Peel (£7.99), is something I have never tried before and was very interested in. Charli had recommended the Naturally Radiant Glycolic overnight peel, but it was out of stock when I went shopping so I thought this would be a suitable alternative.This also came with its own muslin cloth to help buff away dead skin cells and I really love the scent, it is familiar and comforting. I think this would be a great product for those with sensitive skin as it has all the benefits of a scrub without having micro beads - so it wont leave your skin irritated or sore! I have found that this has made my skin feel much healthier and look very radiant. I really like the packaging of the B. products as they are very simple and minimalistic - almost like something you would find in a spa. I also picked up the B. refined exfoliating cleanser (£5.49). I have actually used this before and I really enjoyed it so I had to re-purchase it, especially for £2.73! The exfoliating beads are very small and gentle (you can hardly see them in my image!) but it is still effective enough to leave my skin bright and refreshed. This also has a wonderful clean and fresh scent and I find that you really only need a small amount to cover the whole face! These products give me the impression of luxury on a budget and they do look very nice on display in the bathroom! Finally, a couple of products that aren't Superdrug own brand, but are more than worthy of a mention. The Garnier Cleansing Micellar water (£4.99) is something I have used before and liked a lot, so when I saw it on offer with a 1/3 off I picked up a new bottle. For starters, the bottle is huge - promising 200 uses. Now, I don't know if I quite got that many, but it sure was close as you do only need a small amount for maximum effect! This product is hypo-allergenic and doesn't contain any fragrances or chemicals making it perfect for sensitive skin. It also boasts that it can remove all make up without the need for rubbing and rinsing, and while I do agree that it is very effective, I'm not sure that I personally would use this alone to remove make up and dirt from my skin. I love to use this after cleansing to really remove final traces and it leaves my skin very fresh and clean! I also decided to try the Pond's Institute hydronourishing cream (£4.99). This was on offer at half price when I bought it, but I don't think it is any longer. However, it is a bargain even at full price as the formula is very rich and creamy, and it is even rumoured that Dutchess Kate Middleton is a fan of this skincare range! The packaging on this range is fairly plain and uninspired but the results are nothing short of wonderful. This cream has really helped to hydrate and nourish my skin. I was having a hard time with dryness and a flaky forehead before I stumbled across this, but it has really made light work of clearing it up and leaving my skin soft and lovely! It has a delicate fragrance which is gentle and comforting. I love to try our new skincare, thank you to all who made recommendations to me, I'll be picking up more of your favourites on my next skincare shopping trip! What skincare items are you loving this season? As my long time readers will know, I am a huge fan of contact lenses. I really love the way they can easily switch up your look and how they can make your eyes extra striking. I have worked with Spooky Eyes before and loved the quality of their product. 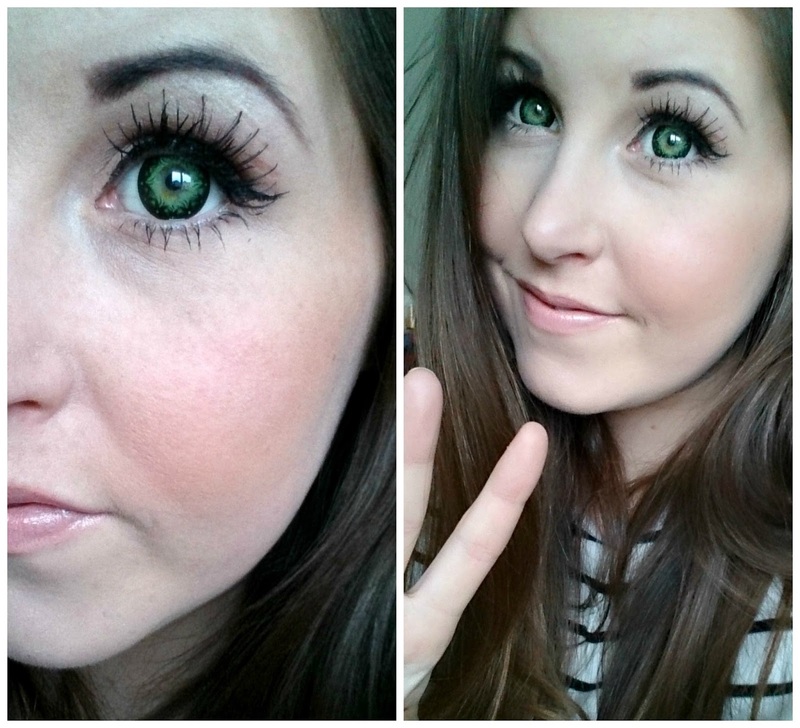 So I was pleased when they recently sent me a pair of their 12 month Galaxy Green contact lenses to try out! The packaging of the lenses is simple but sterile and hygienic. Each lens is supplied in its own disposable case and is floating in sterile solution. I really like this, as anything to do with the eye should be treated with the utmost care and Spooky Eyes really respect that. Once the seal is broken on the temporary case, I like to rinse the lens with a contact lens solution to doubly ensure that they are clean and safe to put into my eyes. 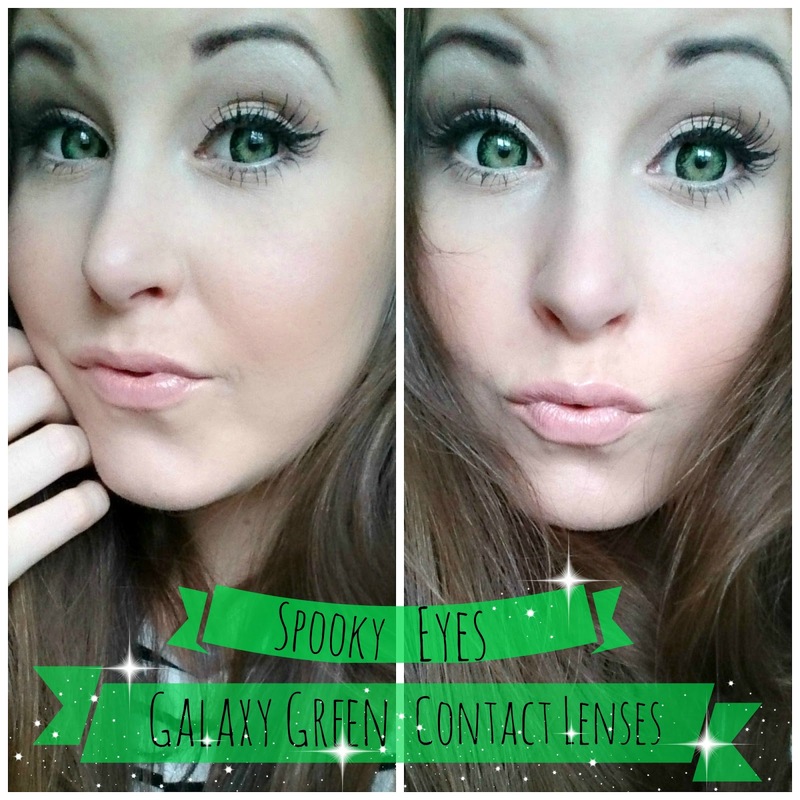 The pattern on the Galaxy Green contact lenses is beautiful! I love the unique design and the different tones of colour really make them pop. All of the Spooky Eyes lenses are thin and soft, and they have a high water content which makes them super comfortable to wear. Once they have settled in, its almost as if there is nothing there atall! 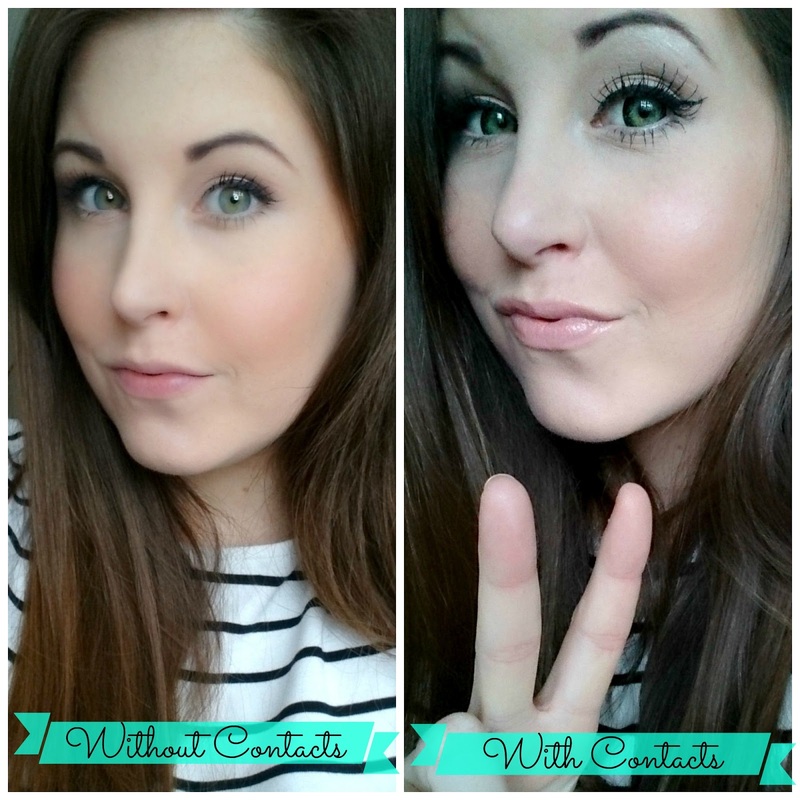 Because my natural eyes are green, I was unsure as to whether these lenses would have much of an effect, but boy, was I wrong! They have a wide circle lens look to them, meaning that they make the iris look larger and more animated. I love the way that the darker green around the edge gives the lens depth and definition while the lighter green in the centre makes for a bright, doll like effect. I added a set of false lashes to further enhance my eyes and I was super pleased with the result. Although these lenses are patterned, I feel it is a subtle enough pattern that you could wear them for an every day look, not just on special occasions. Lots of people are afraid of putting in and taking out contact lenses, but it is actually very simple - and once you've practised a few times you will be able to do its fuss free! These lenses are not provided with a case and solution, so if you want to really make the most of the 12 month life of them then I highly suggest purchasing this too, so that you can keep them safe and sterile. All orders with Spooky Eyes come with free worldwide delivery and mine arrived very quickly which is a fantastic bonus. There are literally hundreds of designs to choose from on the Spooky Eyes website, everything from natural to floral to sparkle lenses - proving that you don't have to wait until Halloween to get creative with your look! I am very pleased with these lenses and recommend all my readers to check Spooky Eyes out - their website will leave you inspired and ready to get creative! 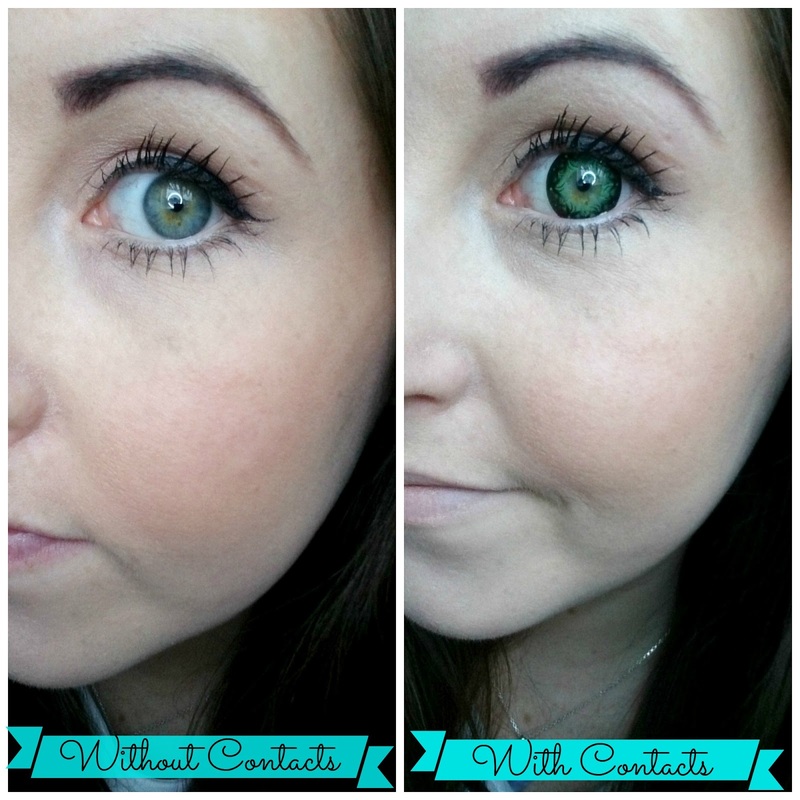 Have you tried contact lenses before? What do you like most about them? 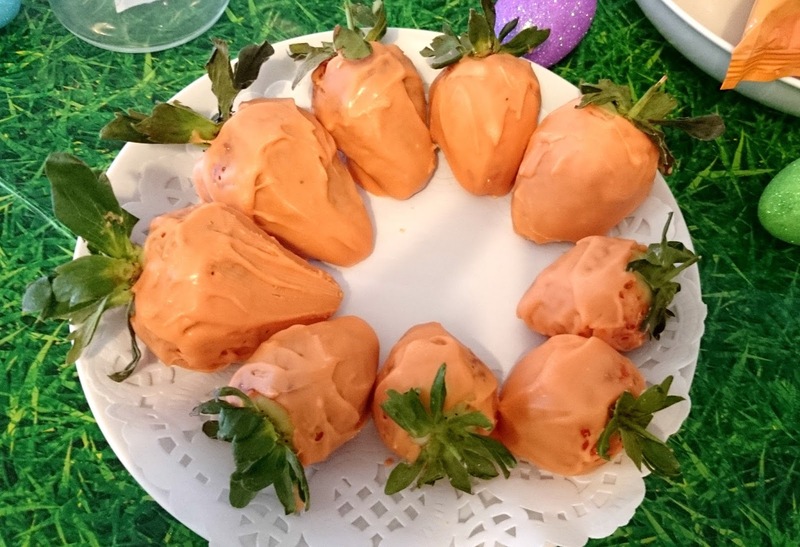 As much as I love to eat clean, I always have time for an Easter treat! 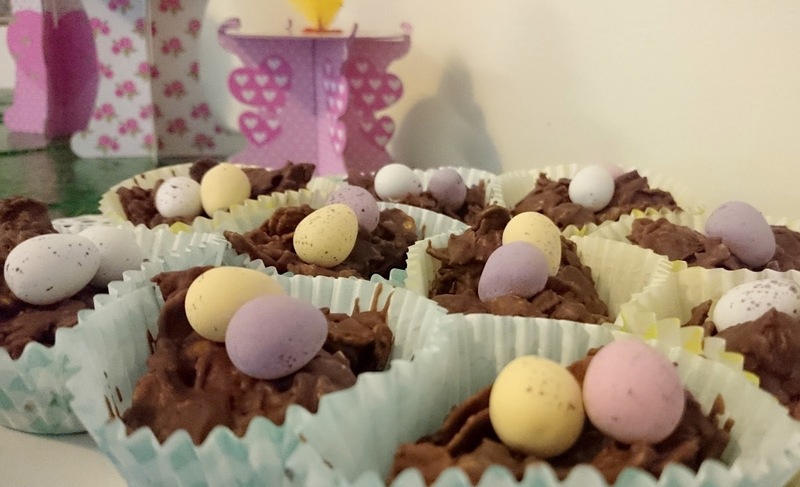 Home baking is such fun and when I saw this recipe for Creme Egg caramel shortbread over on Kerry Cooks Blog, I knew I wanted to try it myself. However, I wasn't too keen on the idea of the Creme egg fondant filling mixed with caramel, so I decided to top my shortbread with some alternative Easter favourites! 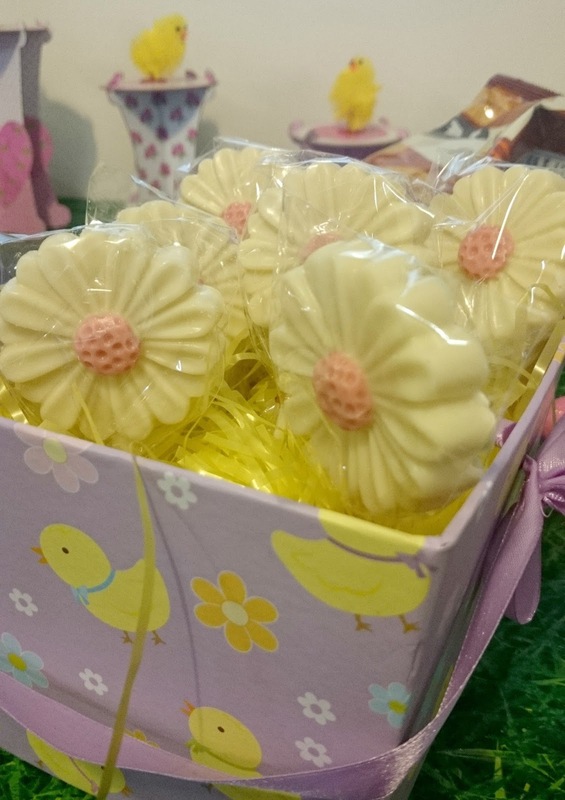 To make your own Easter Millionaire Shortbread you will need.
. Beat the butter and sugar until light and creamy and then add in the Vanilla.
. Add in the flour and combine, my mix went a little crumbly but once i squeezed it together with my hands it was a perfect dough.
. Pat the dough evenly into your baking tray and prick with a fork.
. Place into the oven for 20 minutes or until it looks golden.
. Remove from the oven and let the biscuit cool - leaving it in your baking tray.
. Combine the condensed milk, sugar and butter in a sauce pan over a medium heat.
. Heat for around 10 minutes. The sugar will start to dissolve, turning the mix from a yellow colour to a golden colour and a slightly thicker consistency.
. Once your caramel has reached this stage, remove it from the heat and set it aside for 10 minutes to cool slightly.
. You can then pour it on top of your shortbread layer. * I then popped it into the fridge for an hour to help it harden a little.
. 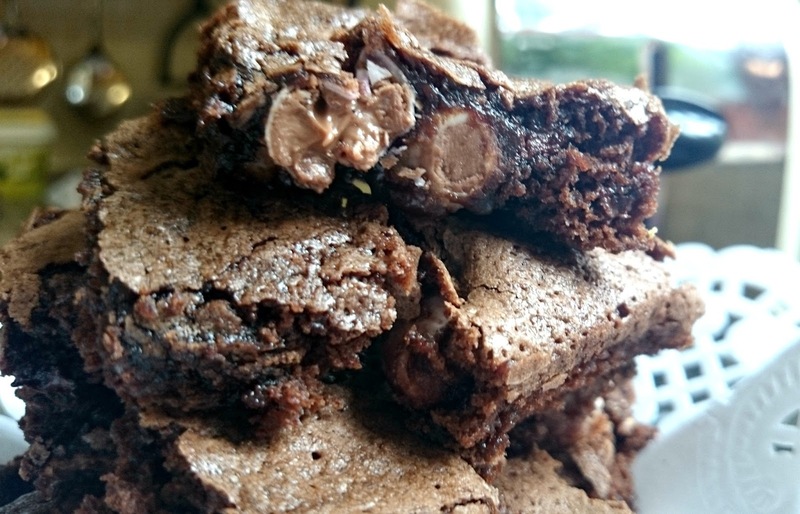 Simply melt the chocolate. You can do this in the microwave in 30 second intervals or, like I did, on a double boiler on the hob.
. Once the chocolate is melted you can spread it over the top of the caramel layer and top it with the Malteaser bunnies and mini eggs in any pattern you wish.
. You'll then need to refrigerate this overnight to completely set - if you can't wait that long I'm sure a few hours will do the trick! Once everything is set, use a sharp knife dipped into hot water to cut into mini, bite-size squares. These little treats are so delicious and definitely worth the wait! They are fun to make and you could decorate them with any toppings you prefer! This Sunday I had a lovely lunch at home with my Bridesmaids. We were on a mission to plan the hen party and the girls did not disappoint! We have planned a day time Western Style Horse Hack and BBQ, an afternoon cocktail class, dinner, drinks and a girls night in sleepover at the Norton Park Spa hotel in Winchester followed by lunch and spa treatments in the hotel spa on the Sunday! I am so excited and the girls are hard at work planning everything. Because my son is due to be born in 4 short weeks, I decided to throw the get together at my own home, but that didn't mean that it couldn't be fun and memorable. 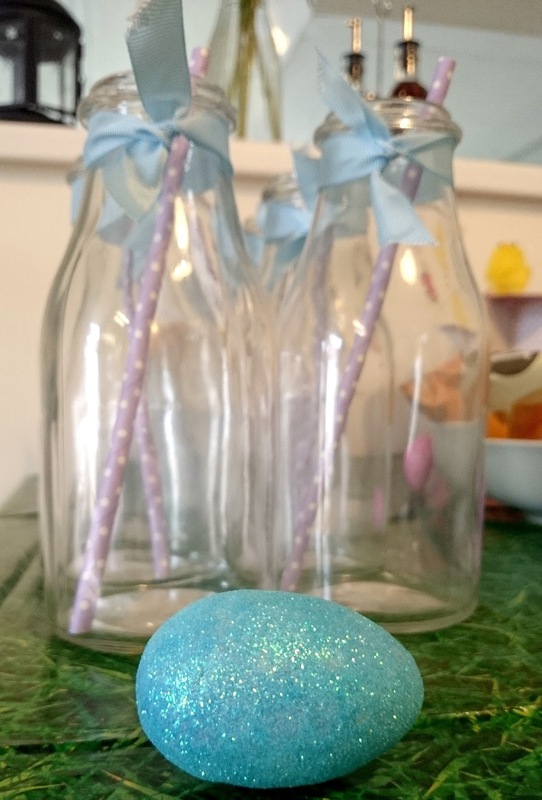 So, I put on a lovely Easter theme lunch with a treat table and some gorgeous drink decorations from 'Prairie Charms'. If you've read my blog for a while you'll know that I have previously worked with Prairie charms and fell in love with them. They are a company which sell all sorts of handmade jewellery, hair acessories, beauty pieces and new for 2015 they have also introduced habitat and packaging pieces! 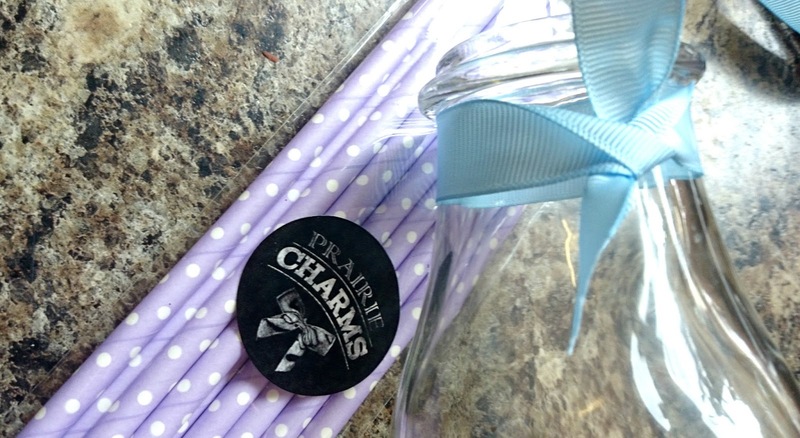 The thing that I love most about Prairie Charms is that they donate 10% of all of their profits to Great Ormond Street Children's Hospital Charity and the, 'Kiss it Better Campaign! 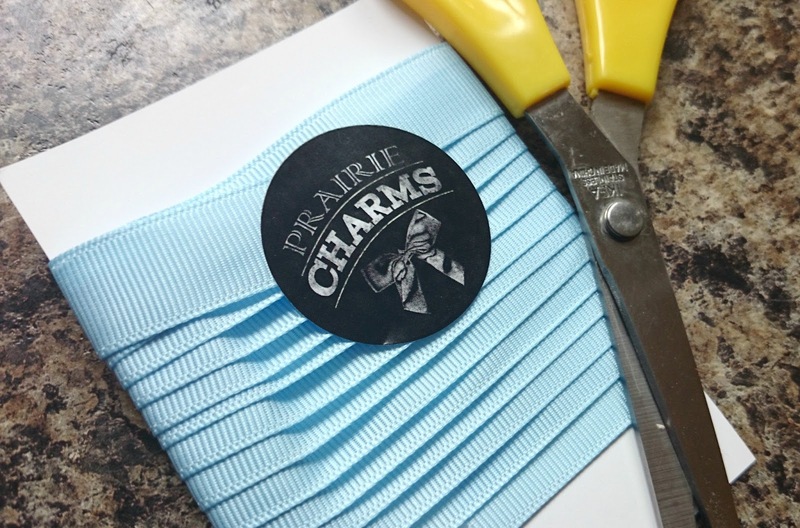 I was so excited when Prairie Charms announced a new collaboration on their Twitter page and I couldn't wait to get involved. 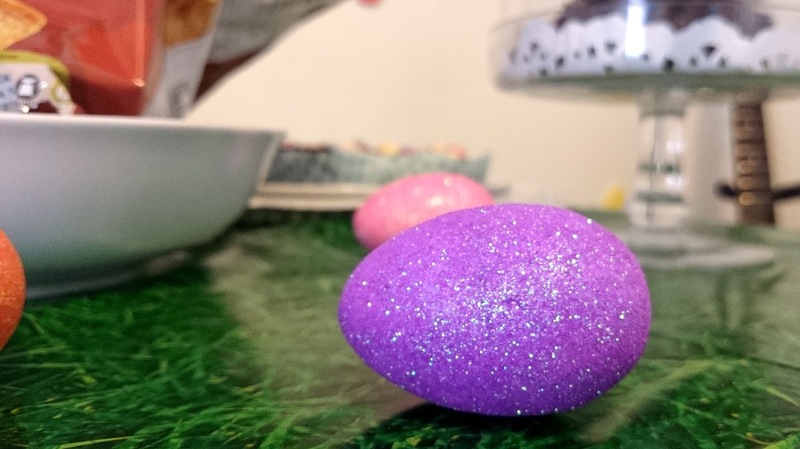 The project aim was to incorporate some Prairie Charms pieces into a lifestyle blog post, and I knew exactly which items I wanted to pick out to decorate my Easter lunch and show you all! I chose these gorgeous Dahlia Purple Polka Dot Paper Straws and this adorable Mila Baby Blue Ribbon and Prairie Charms were even kind enough to send me some ultra sparkly 'Effie Nail Glitter', too (see what I did with this at the end of this post!). 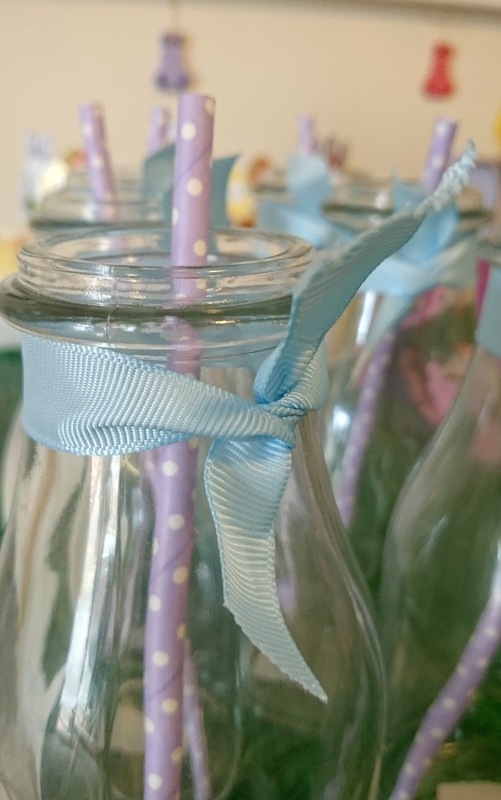 I love that the paper straws have a vintage feel and the pastel purple colour is so perfect for the spring time so I knew it would tie in well with my Easter theme! 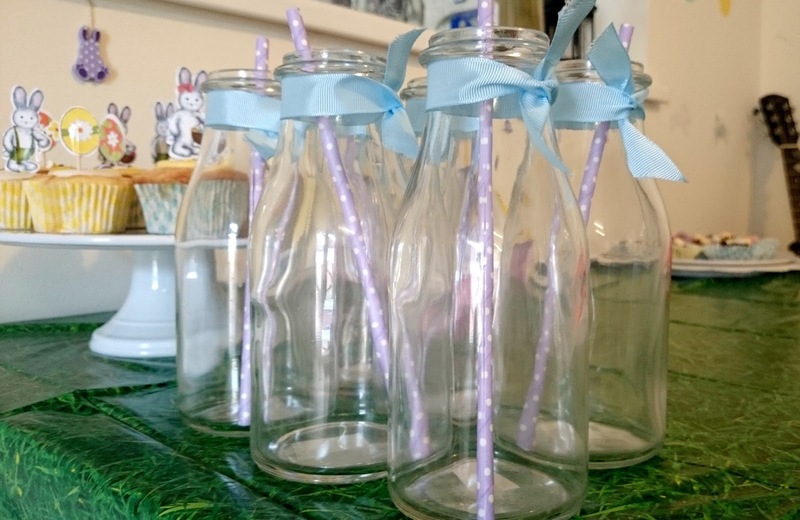 I also love the ribbon as it isn't all thin and flimsy - I used it to accessorise the necks of my vintage style milk bottle glasses and they looked super cute, but you could easily find a million-and-one uses for this adorable ribbon! 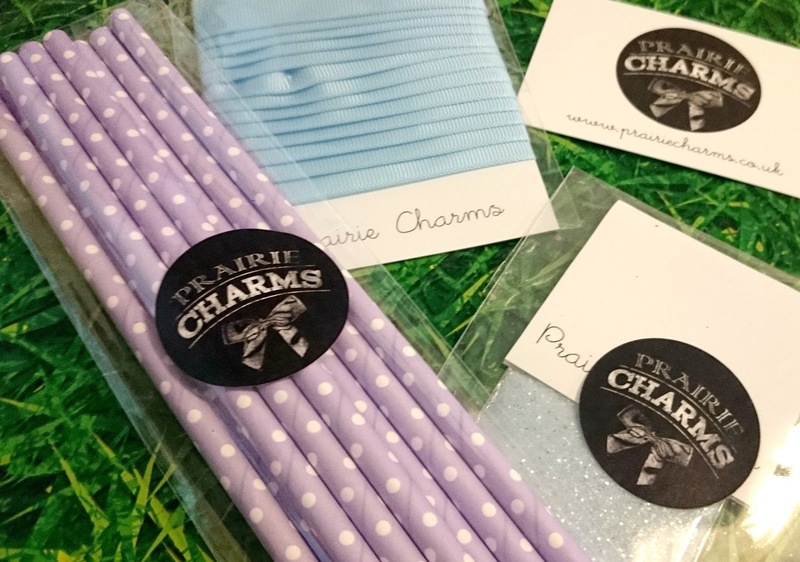 The Prairie Charms packaging is so thoughtful and pretty - everything arrived wrapped in tissue papers and was finished off with the cutest washi tapes and 'Prairie charms' stickers - it's little touches like this which really make a brand stand out and make your shopping experience with them memorable! The girls (and I!) loved the way the glasses looked and I got so many nice comments on the straws too, everyone seemed to love them! We drank all sorts of things like mixed fruit juices and fizzy sodas and the straws really held up! I have used paper straws in the past which seem to disintegrate within minutes but these easily lasted the whole 4 hours of our lunch date! 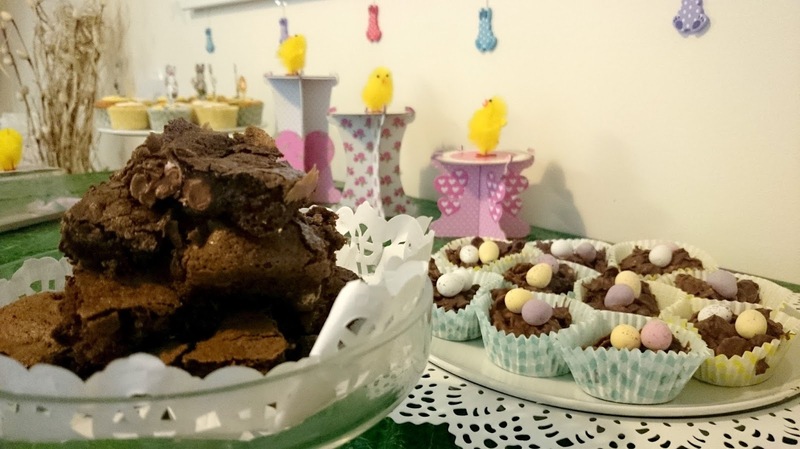 I made all sorts of Easter themed treats for us to nibble on, including these ooey gooey mini egg brownies (recipe coming to my blog soon), Sunny lemon cupcakes and Vanilla cupcakes, 'Carrot' strawberries and traditional Cornflake 'nest' cakes! We also had fresh, crusty bread with meats and some crisps! I love to hand make food as I feel it is so much more thoughtful and you have the chance to be creative. People always seem to appreciate a hand made treat and it's lovely to receive kind comments on something you have worked hard to create. 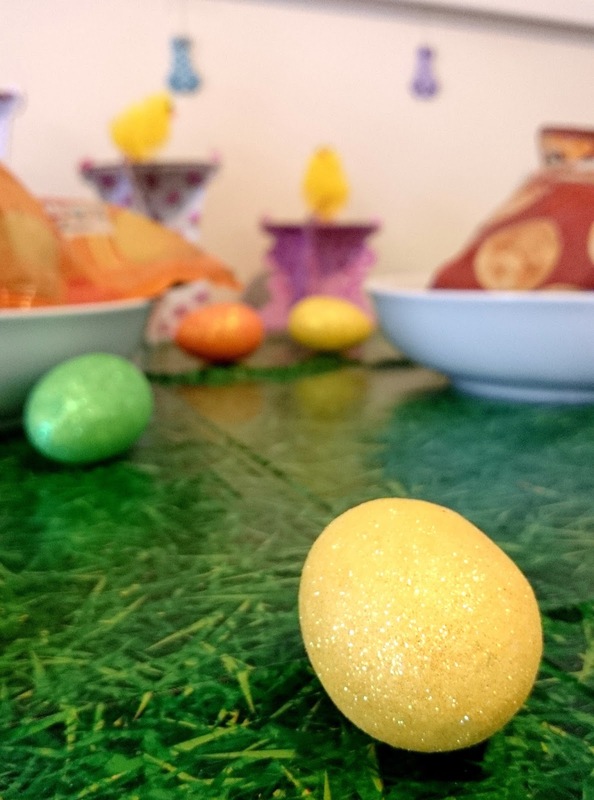 I decorated the treat table with this cute grass print table cloth from eBay, these gorgeous glitter Easter eggs and some traditional fluffy chicks which I placed on different height cake stands for height and drama. I also hung some cute wooden polka dot bunnies above the table! I used my pretty cake stand, cake dome and lace inspired cake tray for extra decoration and attention to detail! I love to decorate and accessorise as it really finishes everything off and gives everyone something to look at - after all, you eat with your eyes before your mouth! 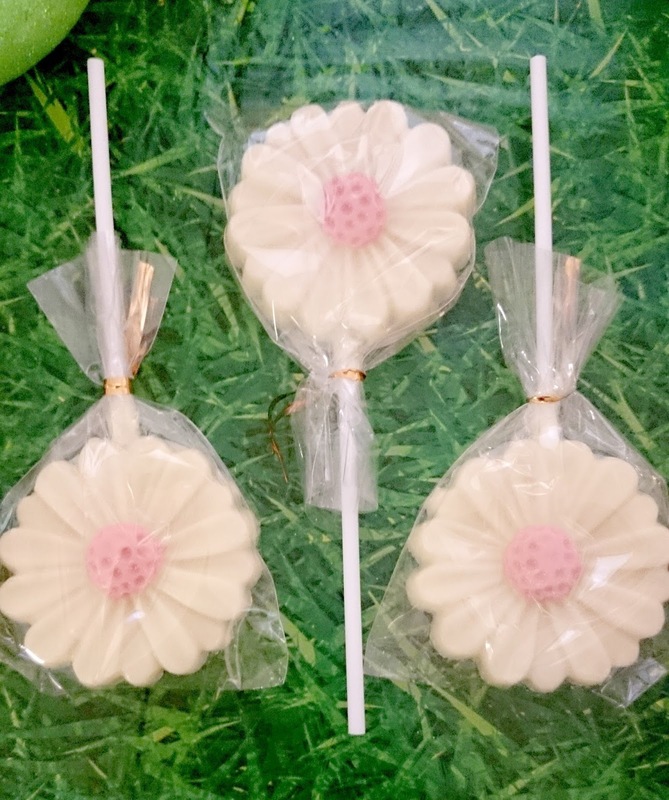 I also bought these cute chocolate flower lollipops as parting gifts for the girls (although most of them tucked into them during lunch!). 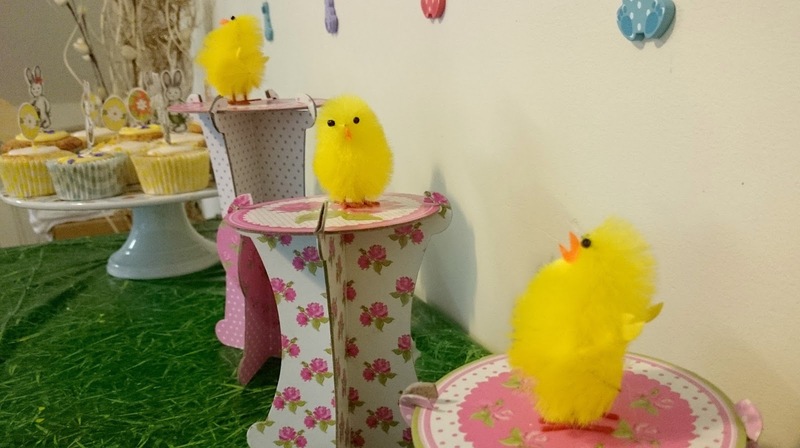 I displayed these in this cute easter box which was just from poundland and helped them stand up straight by filling the box with shredded yellow paper - also from poundland. It looked so cute and just goes to show that you really dont need to spend ridiculous money for a good result. 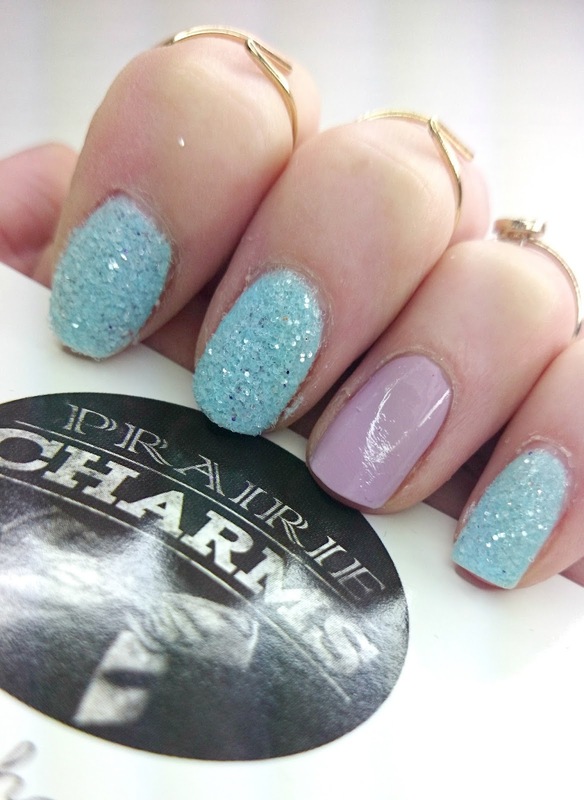 It was so kind of Prairie Charms to send me some nail glitter (and in my favourite colour,too), and I just couldn't wait to try it out, so I gave myself a manicure right away! I painted my nails with Revlons 'Blue Lagoon', and painted a feature finger in Barry M's new speedy quick dry nail paint in 'Lap of Honour'. I then sprinkled on some of the nail glitter, leaving the feature finger plain for some contrast. I really liked that Prairie Charms gave a little tip about using the glitter over a pot or sheet of paper, so that you can collect any left overs and use them next time! My nails look so pretty and the colour of the glitter is just perfect! 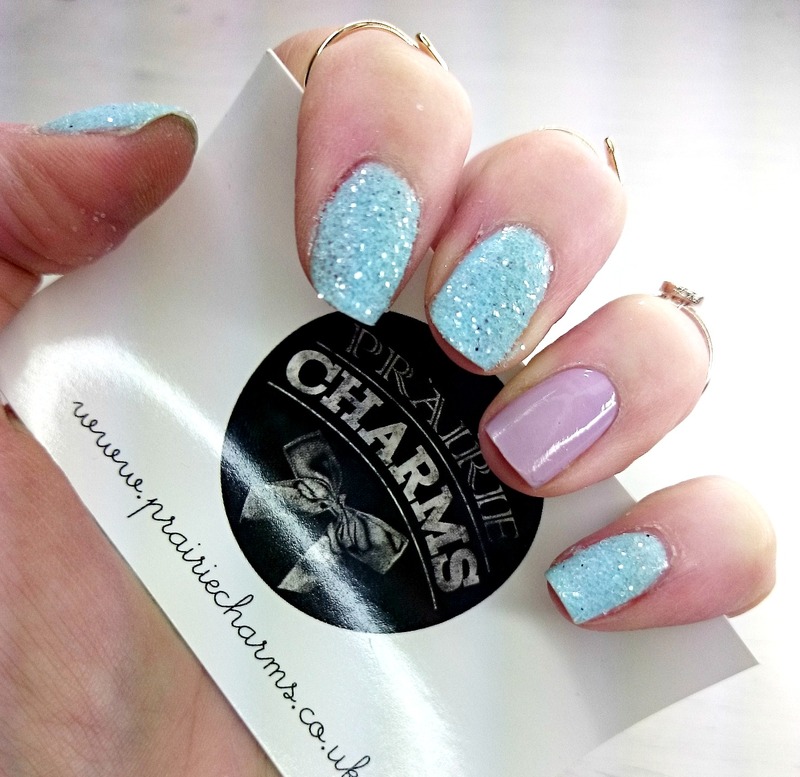 It's delicately sparkly without being OTT and gives the nails that pop of bling. 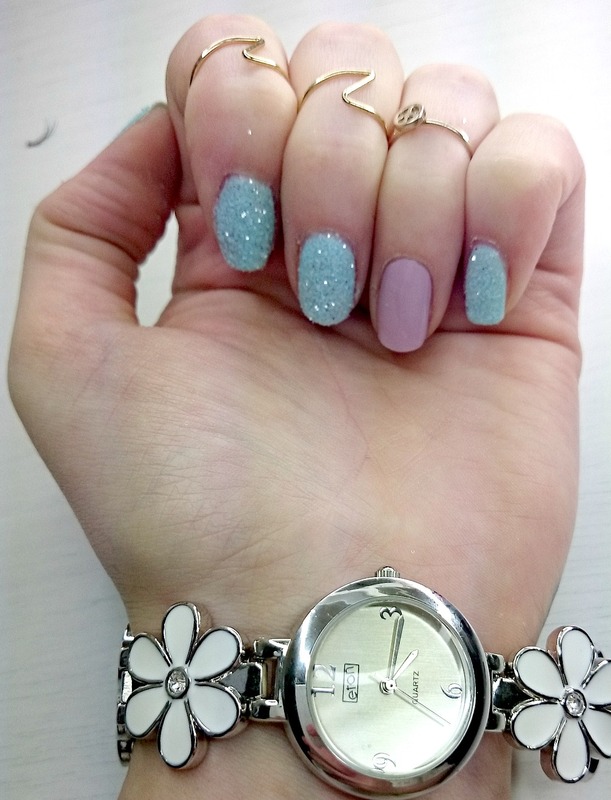 I accessorised with my River Island midi rings and my new floral watch bracelet. 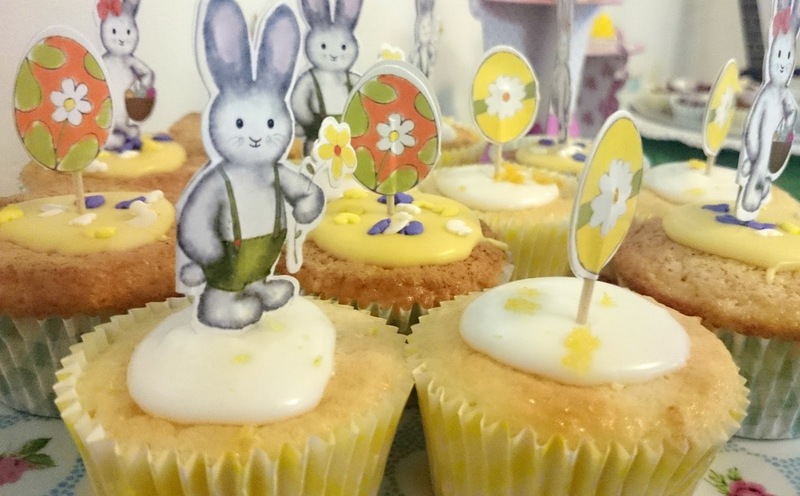 It made for such a pretty spring look and matched my Easter theme lunch perfectly! I had so much fun joining in with this project and I suggest that you all check out Prairie Charms new website and blog when you can. It's great to own something handmade, but its even better knowing that your purchase has helped out a charity, too!